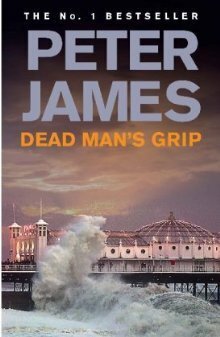 Dead Man's Grip by Peter James is the seventh in the series of Roy Grace novels set in and around the Brighton and Hove area on the South coast of England. This instalment begins with a road traffic accident and describes the accident from the perspective of the people involved, including the events leading up to the accident. I really liked this approach and I found myself being drawn into the story immediately. The plot then takes a very ingenious turn when two of the participants in the accident are found murdered. It’s not only up to Grace and his growing team to investigate the deaths and puzzle out what on earth is going on, but also to try and protect any further people involved in the accident from being bumped off. The storyline is full of imagination and has some great creative twists and turns to the plot line. The short chapters keep the pace up, and mean that there’s always time to sneak in just one more chapter before bedtime! I really like the way Peter James writes about police procedure. He obviously does lots of research but doesn't go over the top when writing about it. There’s just the right amount of police jargon included, and although there are some official acronyms in evidence, they don’t overrun the text, and are always explained. I have to say that Dead Man’s Grip is one of my favourite Roy Grace novels so far. It was was a very inventive storyline that kept me entertained, and, of course, was very well written. It seems Peter James doesn’t do bad Roy Grace novels!